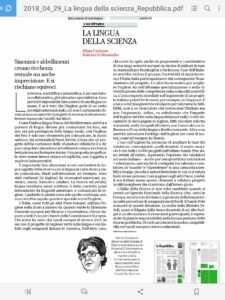 I wrote an article about English as a language for reseach on the main Italian newspaper yesterday. The article was co-authored by prof. Elena Cattaneo, senator for life at the Italian parliament and one of the most prominent Italian scientists. 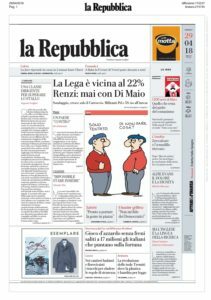 The article is in Italian (it appeared on la Repubblica) and was featured on the front page. The issue is about the language to be used for writing project applications. According to many Italian researchers, Italian should be used. Our opinion is that they should use English, or international reviewers won’t be able to review the projects (which is, sometimes, what the Italian research community prefers).